This is a Russia-Revolutionary South Russia 1000 Roubles banknote. 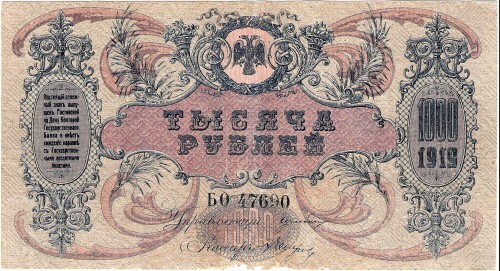 The note is dated 1919, P-s418 and was issued by South Russia Rostov, Government Bank Branch, Gen.Denikin -White. We have 6 notes available in as-good or better condition. Please contact us to discuss the purchase of this note or to make an offer on this note. The note in the scans is the note you will receive. Please judge grade yourself using the scans provided and email if you have any questions.